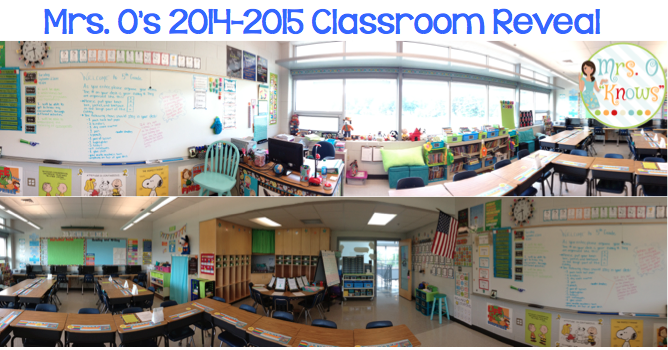 It's finally time for my classroom reveal! Don't you just love that phones can take panoramic pictures now? 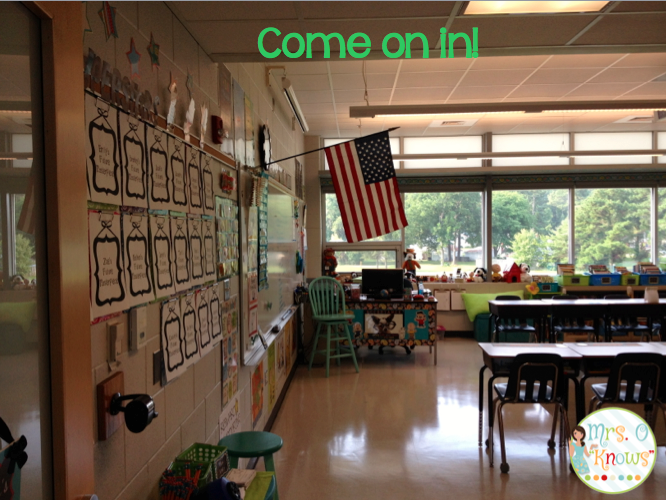 This year, I moved to the second floor of our fifth grade "pod" and so I now have tons of light, which I am super duper excited about! I'm not sure I will still love it when I'm trying to use my document camera, but for right now, hooray for lots of light! If you don't already know, I am a Snoopy fanatic. This goes all the way back to my childhood. Snoopy makes me smile all over and he's totally gender neutral when it comes to decorating because boys AND girls both love Snoopy. There is actually more to this outer window now (it says "Mrs. Ostrander's Classroom" in the lower part), but the picture didn't come out, so I am sharing a picture from the work in progress. I have an outside entrance area, but for some reason, the picture didn't come out, so I will have to add it on Tuesday. As you move along the wall to the right of my clipboard display, I have a giant whiteboard that I LOVE. 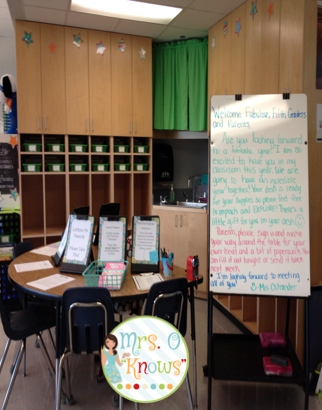 As you can see, it's already prepared for the first day of school, with lots of directions for my students to follow as they enter the classroom. 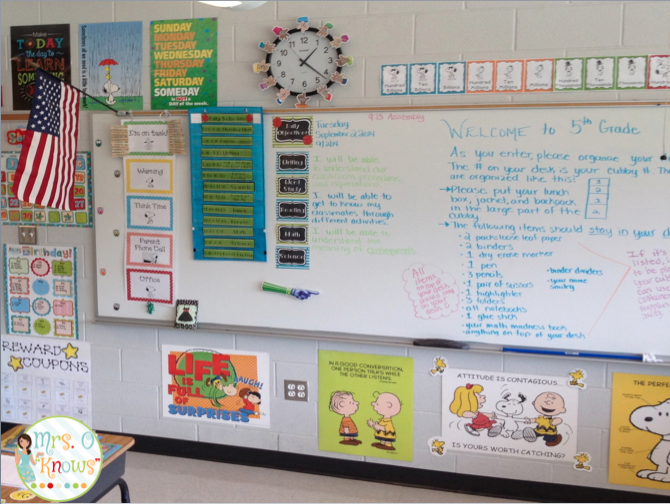 On the left of my board I have my behavior chart, which is next to our daily schedule. Our clock has hands that tell the time in 5 minute increments because I hide the digital clock so that they do not rely on that. Under the clock are my daily objectives. Next to the clock is my place value chart. And of course, I have lots of motivational Snoopy and the Peanuts Gang posters hanging around. The green Peanuts chart is the way that we track student compliments (from other teachers in the hallway). They can earn parties when they earn Woodstocks all the way to the top (14 compliments, to be exact). 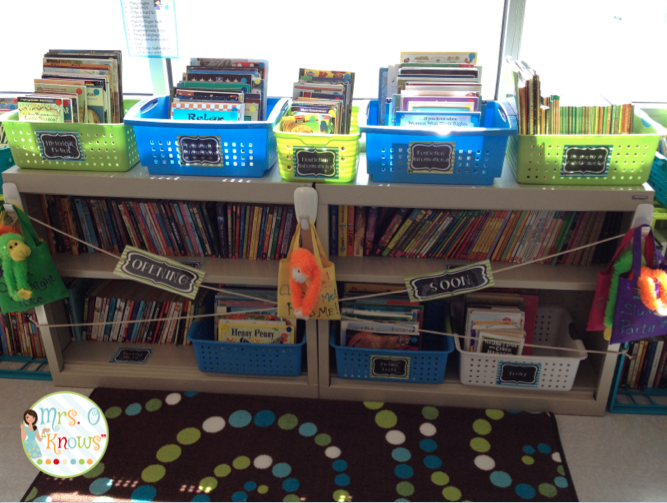 My classroom library spans along the wall that is filled with windows. I have books organized by genre, and then I use stickers to level each one. The books in the stand all the way to the right (that was a going out of business find I'll cherish forever) are chapter book series. The five ottomans that you see are filled with stuffed animals, as is the white bucket next to the series books. If you think that fifth graders are too old for stuffed animals, think again! They love to play with them and use them as reading buddies. They are very much still kids! To make my students extra curious about the library, I always put an "Opening Soon" sign across the books. We don't open the library until we've had time to explicitly cover the rules of our classroom library, since all of the books that you see are my own personal collection. 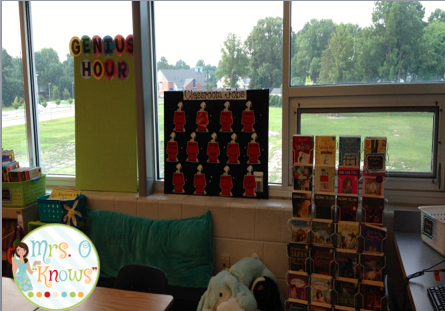 My Genius Board is ready to go and I can't wait to get this wonderful idea started in my classroom. 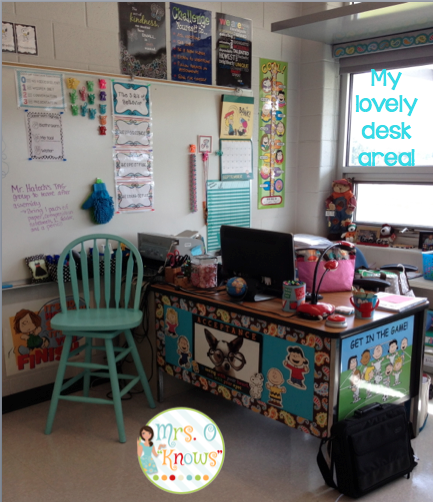 If you want to know more about it, go to Runde's Room to see how she uses it in her classroom! I'm sure I'll be posting about it once we get it started too. 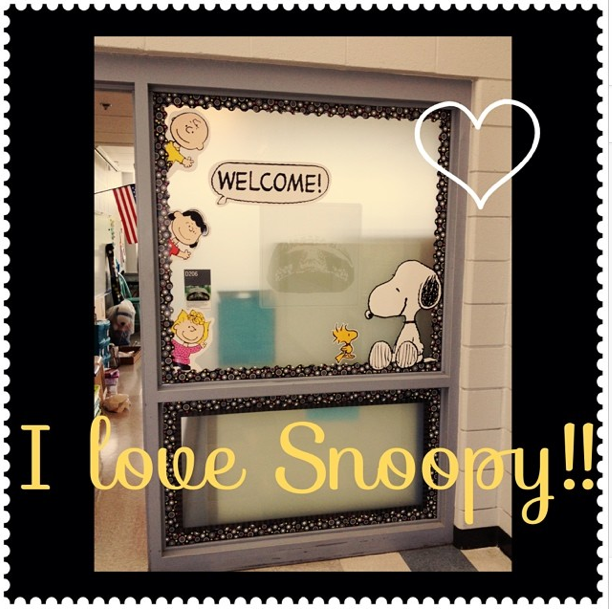 My classroom jobs boards is made out of Snoopy cut-outs, of course! 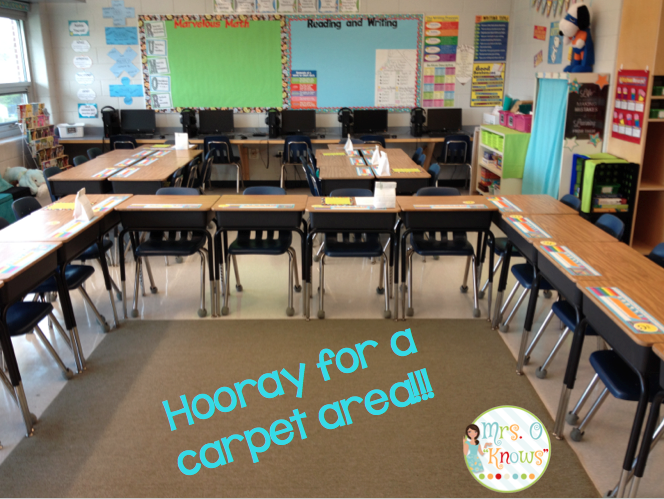 Both boards are large bulletin boards purchased from Office Depot and covered in fabric. My back wall is where my one bulletin board exists. 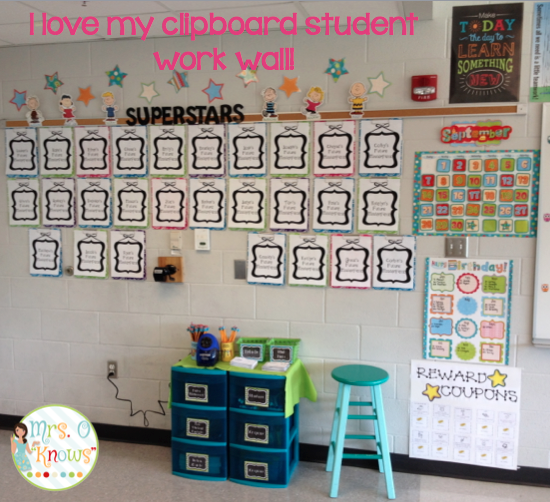 I don't have a ton up yet, because I'll cover these boards with anchor charts, problems of the day, and other resources that are current to whatever we are working on throughout the year. Here's my games and supplies area and MORE SNOOPY! 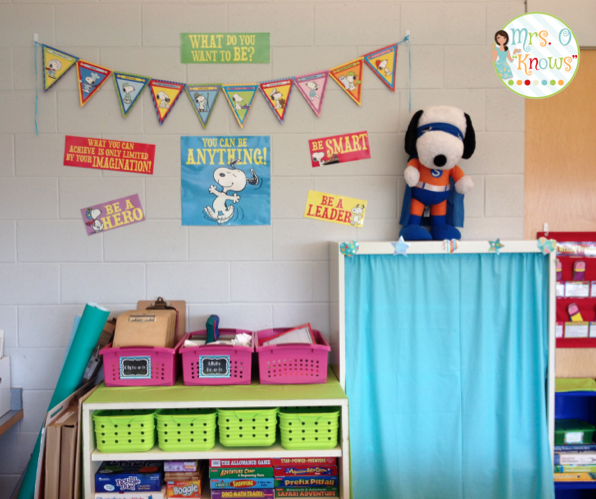 I've got a curtain over the bookcase that holds all of my items for guided reading. Here's our cubby area. We only have 24 cubbies, and I have 27 students, so some of them will have to use crates to hold their items. My kidney table is all set up for open house in this picture. 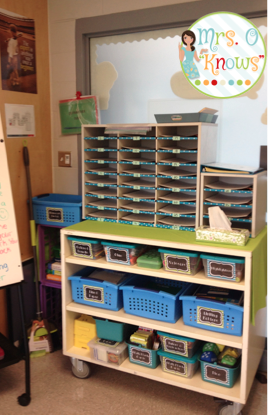 The picture below is my mailbox area, as well as our math manipulatives and supplies area. I finally put a carpet in my room this year. It's a small sacrifice because we have to care for them ourselves. I bought a little push carpet sweeper that I am hoping will work miracles. It is my plan to have the students in the back two groups move to the carpet for any whole group lessons on some days, then on other days, I will have the students in desks move to the carpet, while the students from the back move to their desks. Gotta keep things interesting so those students are engaged 100% of the time! Woohoo! 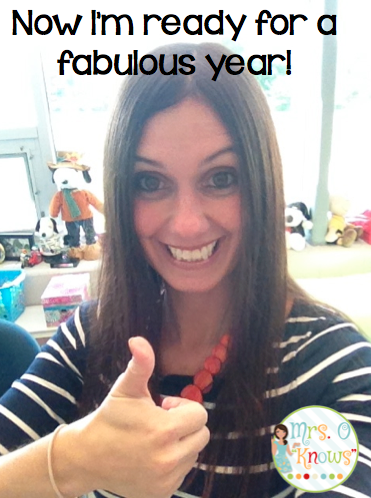 Just a couple of days to go before it's time to begin my tenth year of teaching and welcome my kiddos to their fifth grade home! Oh, Skyping their presentations sounds great! I'm going to have to find out our rules on Skype at school and let you know! I'm definitely interested! It looks so great! I need to paint my stool again, and I might go with just a clean solid color look. That blue is my favorite! 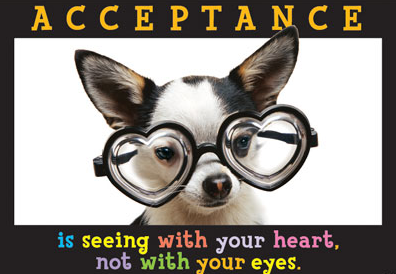 I love all your bright colors! Your blog gave me some great ideals!! Thanks again.